By Wednesday night, branch member Jennifer Ortiz had heard no official word on whether her home had survived after the fire spread to the Mountain Shadows neighborhood, where it burned at least 300 houses. John and Katherine Brophy, who live outside the burned area, own a rental house next door to the Ortizes and were also awaiting word on its status on Wednesday afternoon. The Ortizes learned of the fire early in the week while on vacation in the Washington, D.C., area. Before a mandatory evacuation order was enforced in Mountain Shadows, branch members pulled some of the Ortizes' valuables from their house and covered it with tarps to protect it from flying embers. "We're just so grateful to everybody for their help and prayers," Jennifer says. 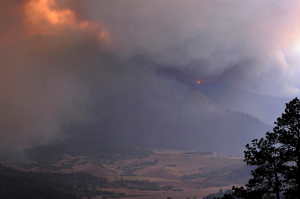 Events took a turn for the worse on Tuesday afternoon, when 65 mph winds caused the fire to leap over a ridge and move toward occupied areas. Kelly McMullen took in evacuee Judy Allgeyer on Tuesday evening. “I was still up around 12:30 when a strong waft of smoke came through the open windows," Kelly says. "I went outside and walked near Cragmor Christian Reformed Church, where we have our branch meetings, looking to the west to see if the flames were getting worse. I found four other neighbors doing the same thing. You could hear sirens in the distance, a constant background noise.” Kelly spent Wednesday glued to the news reports on TV. “Even the calm among us are watchful, as we pray for safety and deliverance from the danger." The Ehemanns had to move out the same afternoon, along with several relatives who are visiting Colorado Springs for a family reunion planned for this coming weekend. Keith and Cathy Houin stopped by Judy Allgeyer's house before they left the neighborhood to make sure she was taken care of. The Triplett family voluntarily left their home on Sunday. All three families are staying with friends in the city. Jon Grams left his Manitou Springs home south west of the city early in the week, but as the fire moved north, he was able to return home, in time to assist the Whites with their evacuation. “It will take dozens of years for vegetation to come back in burned areas,” he says, pointing to one of the fire's long-term effects on the city. Branch leader Pat Hrbacek could see the smoke and fire moving down toward occupied areas from his office on Tuesday afternoon. “Branch members are looking out for one another,” he says. “People are good at getting on the phone and checking in. The hardest part was confirming that everyone was okay. Kevin Ranaghan (South Bend) has been sending out email updates, and knowing that people are praying for us is very comforting. It means a lot to everybody here. Love you guys in Colorado Springs! We're all praying here in Minnesota. So sad to see those mountains burning in my childhood home! We have you on our hearts and minds continually. Checking in often to see and hear the lateness and praying lots. So good to get this report. I am so grateful everyone is safe. Thank you Lord! I'm praying, I'm praying, & I'm also praying and getting others not in the community here in South Bend to do the same. We luv yah. We are with you in our hearts and prayers. Praying for you for the Lord's peace and strength. Praying for all of you and your city. Our prayers are with you. May His angels surround all of you and protect you. Our prayers are with all of the people in Colorado Springs, especially members of the People of Praise branch there. May God send rain and cooler weather to assist the firefighters in controlling the forest fires. Prayer works! POP is alive & well in Colorado Springs. Community is new to me but I see the strength that it brings to those who are hurting. May the strength God gives flow to all who live in Colorado in POP or not. May His peace rest on a community that will take quite a while to recover. God has a plan & it will be interesting to hear what He is doing with everyone as this horror passes. The strength of community here in CS plus the extended community of POP like all of you is a mighty bulwark against the enemy of fire in this case. The outpouring and response through many avenues is so reassuring. We thank God for bringing us all of you. Our Prayers are going up for all the people who are in danger from these fires. The members of the Colorado branch have been on my mind daily for the past 2 weeks so i am grateful for this news. Continuing to pray for the stillness needed to calm these fires. God bless all of you as you watch and wait. God's ways sometimes are not our ways. May the Spirit give you peace. After nearly 11 years of calling Colorado Springs home, it was devastating to watch these wildfires take over so much beauty and life. However, the love of brothers and sisters does conquer and establish an even stronger witness of the Father's love and care. God be with you all in the waiting to return to your homes and move forward in His peace. You are ever in our thoughts and prayers. We were alerted as we left for Buffalo camp and have been asking the campers and staff here to be praying for all of you this week. I am so grateful for the prayers of my sisters and brothers who have been praying for all of us in Colorado Springs! My house as well as the Brophy's house was spared from the fire. But my heart is breaking tonight as I learned earlier today the names of some of our church members who lost their homes. Please continue to pray for our city community. We are also having problems with buglaries of homes in the evacuated areas of the city. At least 22 homes so far have been broken into. Our street is still under mandatory evacuation. The fire is still burning just west of our neighborhood so a change in wind could put us in harms way again. Please continue to lift us up in prayer and especially for those who have suffered losses and the 1,000 firefighters still battling this fire. I'm praying for you! God brings beauty from ashes and I'm counting on that for you! Count on our prayers as the fire rages. The Lord is with you.